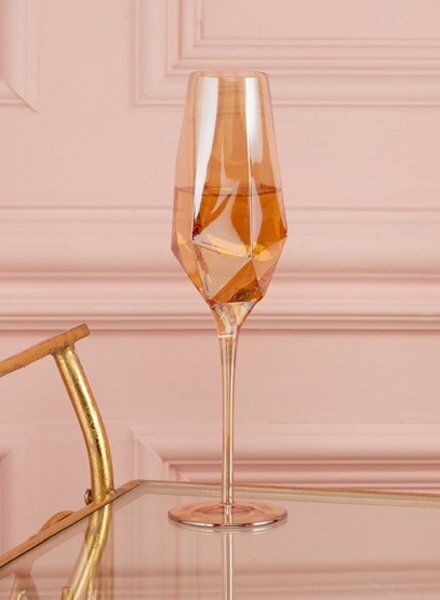 This iridescent amber colored champagne glass featured a unique diamond faceted design. Great for a bridal party, shower or housewarming gift. 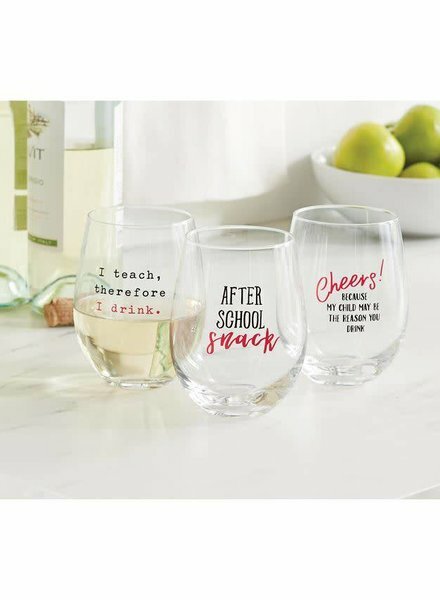 Elegant wine glasses with rose gold lettering. 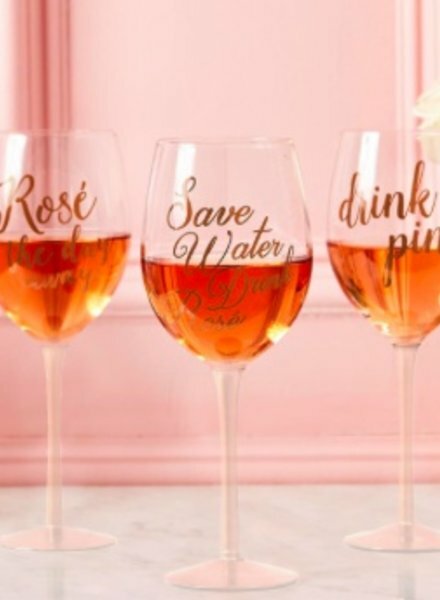 3 Sayings available: Drink Pink; Save Water Drink Rose; Rose The Day Away. Great for bridal shower, bachelorette party or girls weekend. The perfect gift for any sailor! 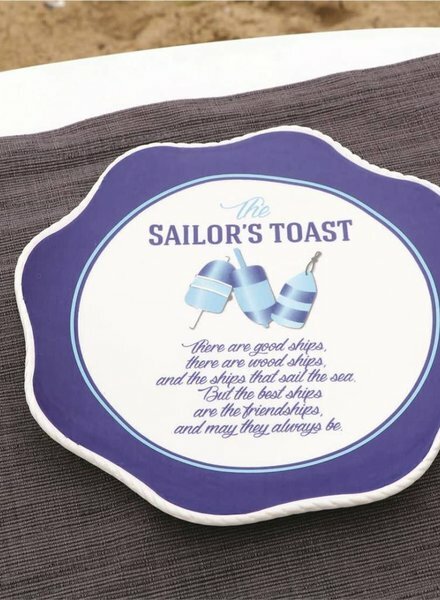 Ceramic plate features witty sailors toast to friendship with buoys and scalloped trim detail. 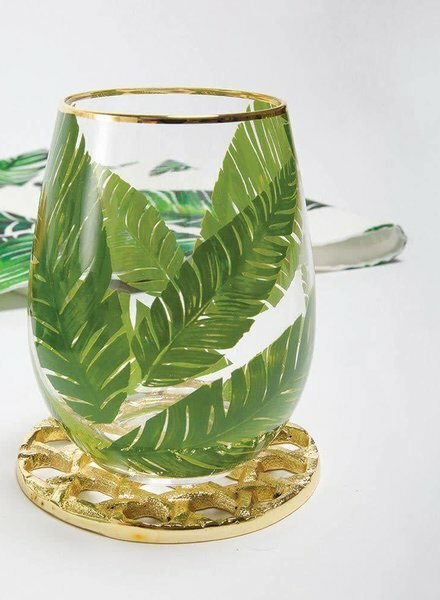 Botanical leaf stemless wine glass with a tropical feel. Be on vacation right in your own home . 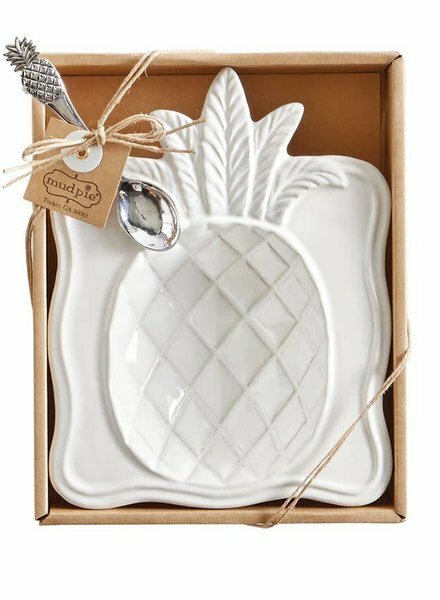 Textured ceramic pineapple sponge holder features rind and crown detailed exterior. 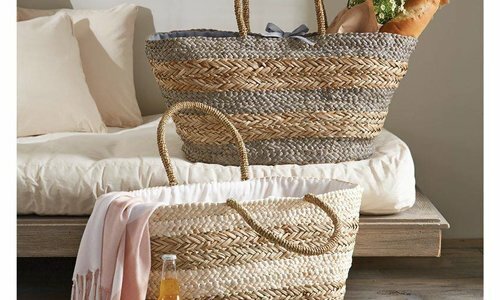 Perfect for a coastal kitchen or easy hostess gift. 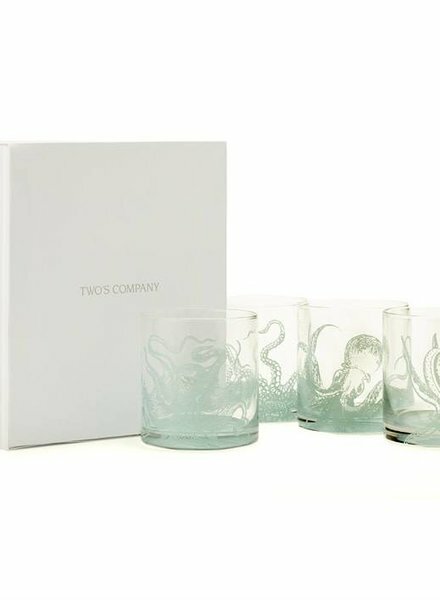 Set of 4 double old-fashioned glasses with octopus design and assorted sayings on the interior glass base. Sayings include Down the hatch, Shipwrecked, Three sheets to the wind, Don't rock the boat. Includes gift box. In full bloom! 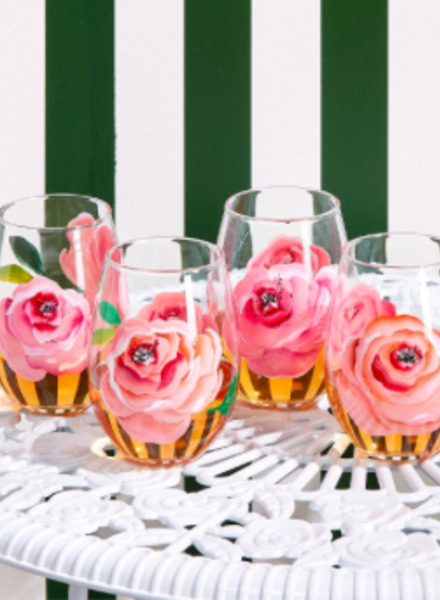 Stemless wine glass features hand-painted roses. Exact design may vary. 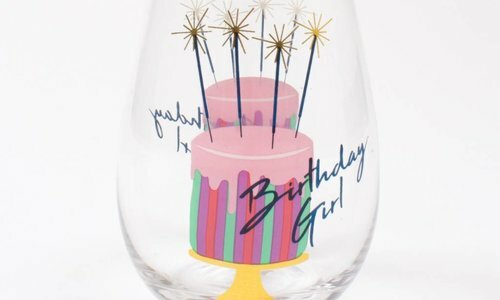 Can be personalized with a name or monogram. 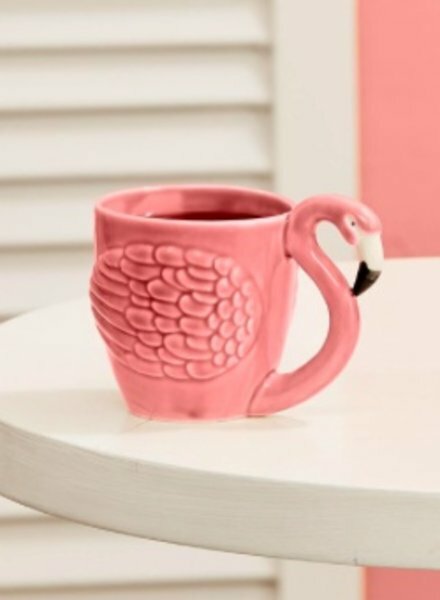 Brighten up your morning coffee or tea with a pink flamingo teacup. Holds 8 oz. 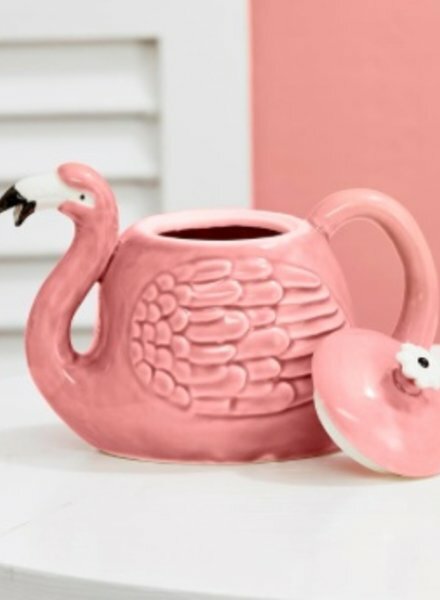 Pairs well with the flamingo teapot! Porcelain flamingo teapot for one with lid. 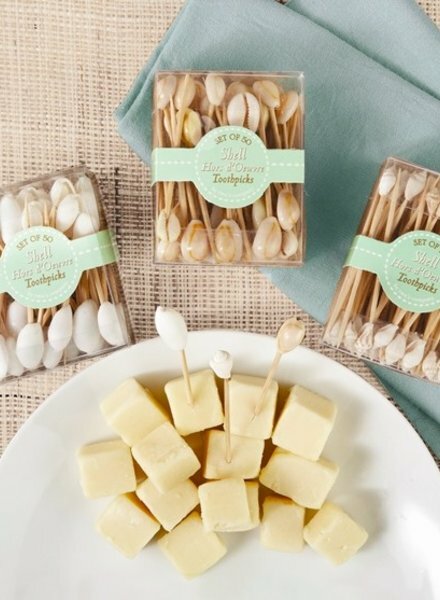 These Seashell Hors D’Ouevre Picks are a perfect way to entertain guests uniquely, adding touches of the sea to any party. The shells come in three assorted styles: Nassa Shell, Sigay Shell, and Bubble Shell. Enjoy a taste of summer with this delicious lemon meringue pie plate and recipe! 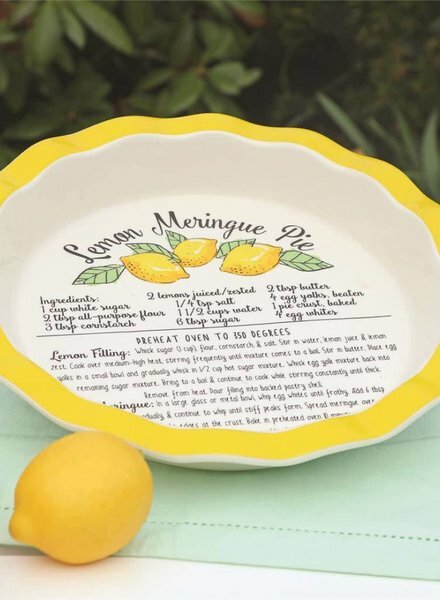 Stoneware pie plate features mouthwatering lemon meringue pie recipe and scalloped trim detail. 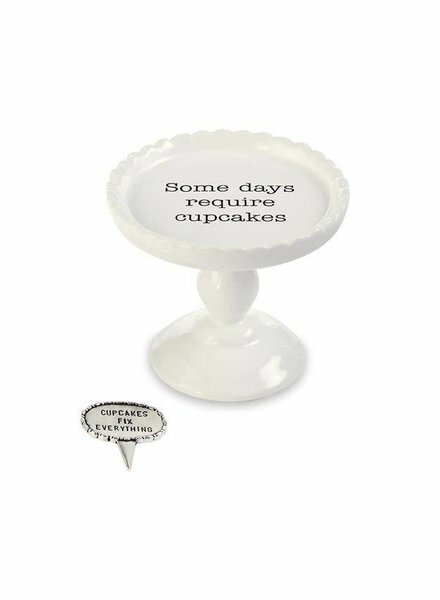 Ceramic cupcake stand features scalloped rim detail and debossed cupcake "Some days require cupcakes" sentiment. Pairs with stamped metal sentiment topper. Arrives boxed ready for gifting. 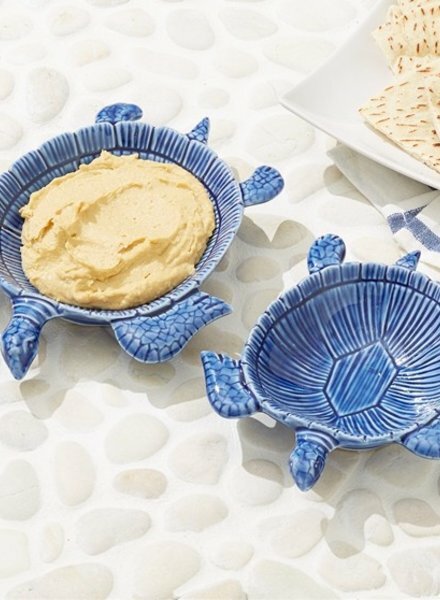 Set of two blue food safe sea turtle bowls. 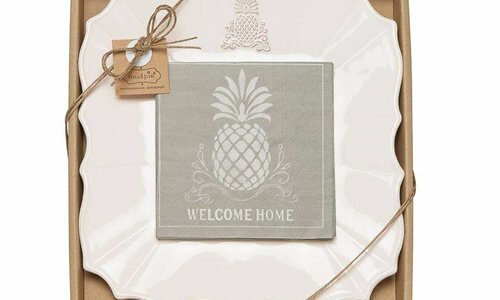 Perfect size for dip and an adorable addition to any tropical tablescape. 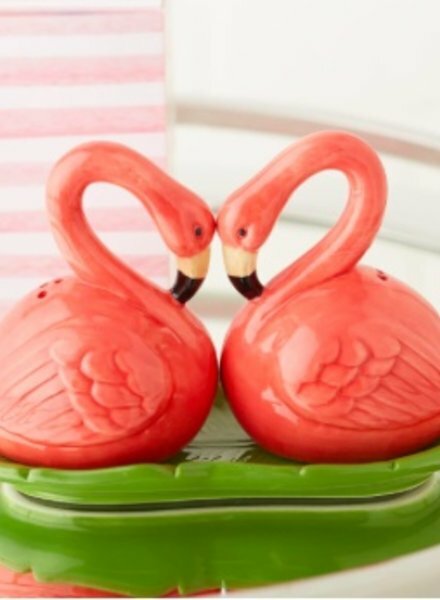 Spice up mealtime with this ceramic flamingo salt & pepper shaker set! Arrives in gift box ready for giving. 3 piece set ncludes two flamingos nestled atop a palm frond. 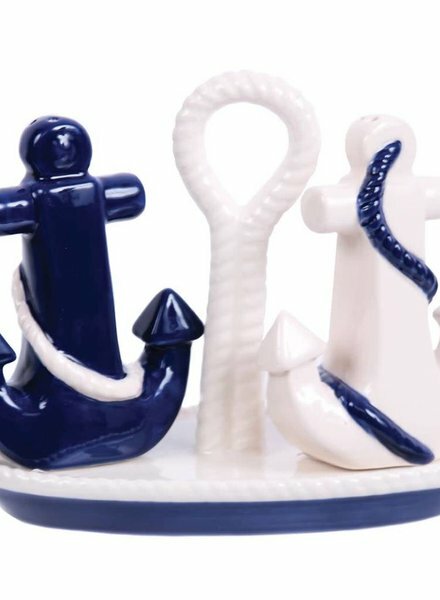 Add a nautical accent to your tabletop decor! Ceramic shakers feature embossed anchor and rope design on base. Navy blue & white. 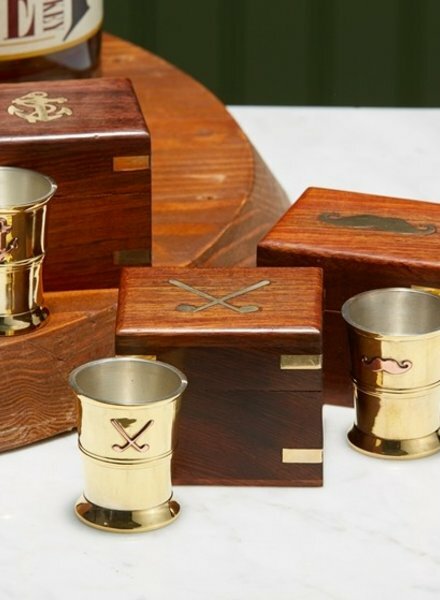 Shot glass comes in wood keepsake hinged box making the perfect gift for any gentleman. 3 designs available: anchor, mustache, golf clubs. 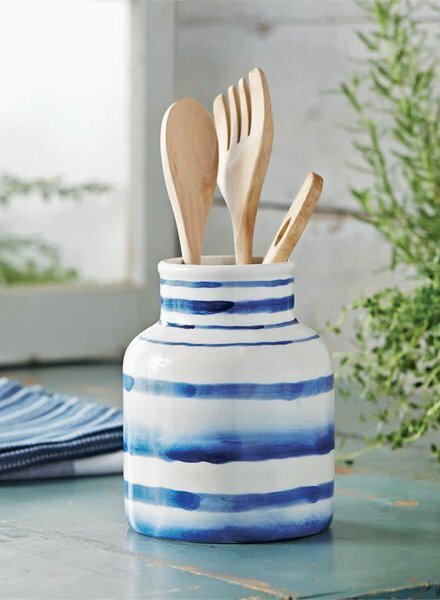 A beautiful focal point to any kitchen, this ceramic utensil caddy features blue hand-painted watercolor accent stripes and is ideal for any kitchen! White ceramic candy dish features scalloped rim and textured pineapple serving well. Comes gift boxed with metal spoon with textured pineapple handle detail. 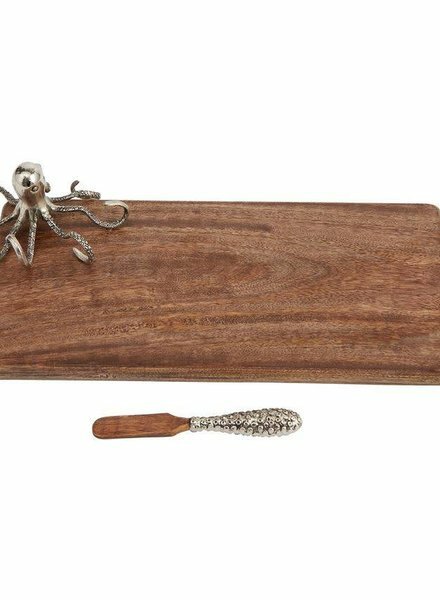 Mango wood cutting board features attached cast aluminum octopus accent with textured tentacle detail and arrives with mango wood and metal coordinating spreader. 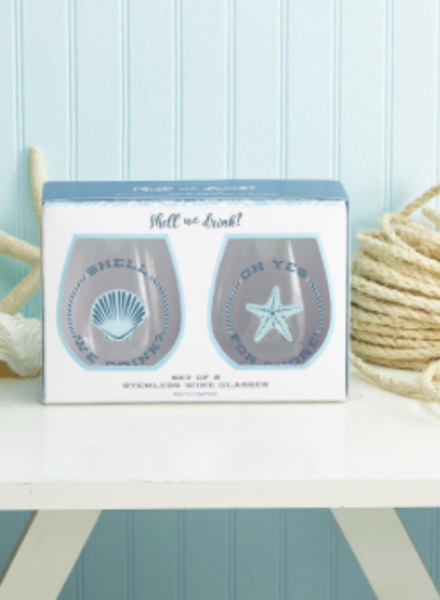 Shell we drink set of 2 stemless wine glasses arrive in a gift box perfect for giving. Available in 2 Sets: Shell/Starfish and Shell/Sand Dollar.